HOW CAN YOU LOVE THE WORLD,AND NOT ITS CREATOR. The house,the car,the boat,the degrees,nor the money can’t save,heal,nor deliver you from death nor hell . “Do not love the world or the things in the world. 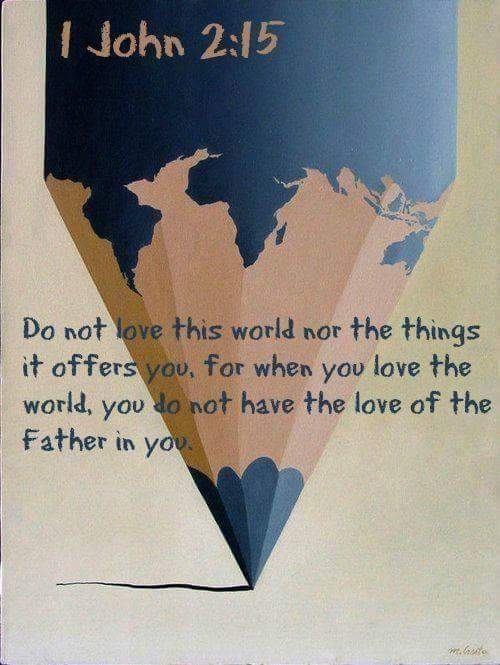 If anyone loves the world, the love of the Father is not in him. For all that is in the world—the lust of the flesh, the lust of the eyes, and the pride of life—is not of the Father but is of the world”. (1 John 2:15‭-‬16 NKJV). “But what things were gain to me, these I have counted loss for Christ. Yet indeed I also count all things loss for the excellence of the knowledge of Christ Jesus my Lord, for whom I have suffered the loss of all things, and count them as rubbish, that I may gain Christ and be found in Him, not having my own righteousness, which is from the law, but that which is through faith in Christ, the righteousness which is from God by faith; that I may know Him and the power of His resurrection, and the fellowship of His sufferings, being conformed to His death,”. “For I know the thoughts that I think toward you, says the LORD, thoughts of peace, and not of evil, to give you an expected end”. “Beloved, I pray that you may prosper in all things and be in health, just as your soul prospers. For I rejoiced greatly when brethren came and testified of the truth that is in you, just as you walk in the truth. I have no greater joy than to hear that my children walk in truth”. (3 John 1:2‭-‬4 NKJV). “But you are a chosen generation, a royal priesthood, a holy nation, His own special people, that you may proclaim the praises of Him who called you out of darkness into His marvelous light; who once were not a people but are now the people of God, who had not obtained mercy but now have obtained mercy. Beloved, I beg you as sojourners and pilgrims, abstain from fleshly lusts which war against the soul, having your conduct honorable among the Gentiles, that when they speak against you as evildoers, they may, by your good works which they observe, glorify God in the day of visitation”. ( Peter 2:9‭-‬12 NKJV). •Only what God thinks about us really matters. •In God’s mind we are His beloved sons and daughters, kings and queens, lords and rulers, and in Christ Jesus we are overcomers, victorious and more than conquerors. •Yes, our God thinks more of us more than we realized and it’s all because He loves us. May we all continue to think of Him and more than we usually do. This entry was posted in Daily Message and tagged how God looks at you, nothing in this world can save you.